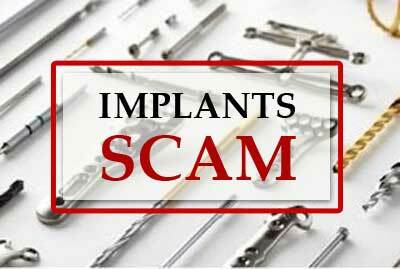 Mumbai: Probe has been ordered into the so-called implant scam, after the Maharashtra FDA seized unlicensed medical devices worth over Rs 1 crore, from the residential quarters of the state run GT Hospital in a raid. Medical Dialogues team earlier reported that acting on a tip-off, the Maharashtra FDA team raided the premises of the hospital, in particular room no. 306 on the third floor of one of the hospital buildings, where they discovered one Vineet Tukaram Pimpale operating from the premises in the name of M/s. Medicol Surgical & Hospital Equipment. The firm was operating without license. Stock of various orthopedic implants, including Intramedulary Nails and Interlocking Bolts were seized from the premises. It is reported that said implants were being supplied to patients of GT, JJ and St George hospital with the authorities suspecting the involvement of doctor/s in the said racket. A report in TOI points out that while Pimpale has no official association with the JJ Group of hospitals, his orthopedic surgeon brother had previously worked there. A doctor from a state-run hospital, on condition of anonymity, told the daily that in the past they have come under political pressure to buy implants from Pimpale. It is reported that the rooms in the said part of the building belonged to the resident doctors and with room 306 being used as a store room. Hindu reports that now A three member committee has been formed to investigate about how an outsider had occupied a room in the hospital’s staff quarter where he had stocked the orthopaedic implants illegally. The committee will also inquire on how many patients from GT, JJ and St George hospital were supplied these devices.